The Marine Corps wants to update an existing laser-targeting technology so that Marines can deliver precision-guided bombs even if their GPS system is jammed or disrupted. The Corps is officially asking the defense industry for a small portable device that will aid Marines on the ground in guiding laser-guided bombs to a target. Instead of relying on GPS, laser-guided munitions instead use sensors to lock onto targets that have been lased by either ground-level troops or from the air. 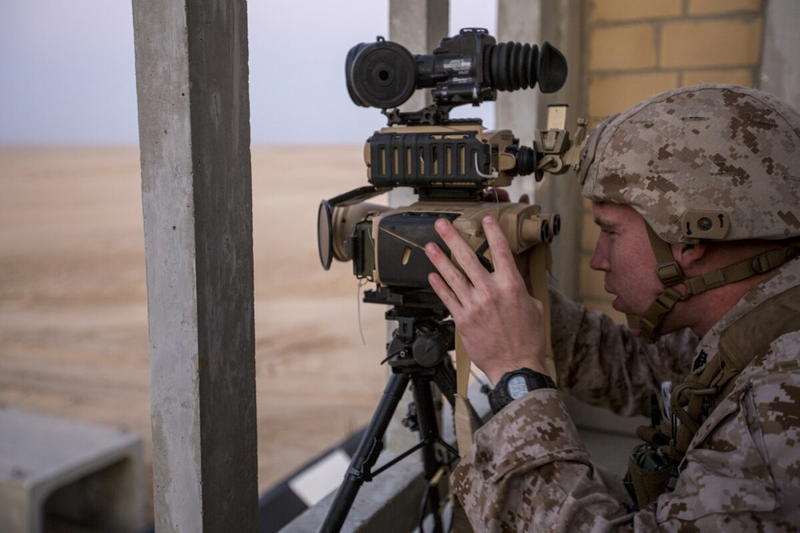 Officials at Marine Corps System Command submitted a request for proposal in December for a new lightweight laser-targeting system called the Next Generation Handheld Targeting System. It’s the latest sign that the Corps is slowly preparing for operations in GPS constrained environments. While GPS-guided munitions have been vital to America’s military operations overseas, America’s total dominance of space is coming to a close with rising powers like Russia and China. That means America’s adversaries may be able to jam or disrupt GPS, putting American military operations that rely on the system at great risk. Laser guided munitions have been around since the Vietnam War, but the current devices are large, heavy and clunky. Now the Corps wants to to develop a newer version of the laser designator that is smaller and lighter to ensure rapid deployment and ease of targeting. “Currently the United States Marine Corps (USMC) uses three separate systems to perform rapid target acquisition, laser designation, and laser spot imaging: the Portable Lightweight Designator Rangefinder (PLDR), the Joint Terminal Attack Controller Laser Target Designator (JTAC LTD), and the Thermal Laser Spot Imager (TLSI). These systems are heavy, unwieldy to carry and transport in the field, and contain multiple components,” the SYSCOM request reads. The Corps wants to invest in new technology that will create an all-in-one system that is compact and can fit in the current issued FILBE pack. “The total system weight requirement is 15 lbs., which includes a 7.5 lbs. handheld unit, batteries for 72 hours, cables and tripod,” Lt. Col. Bradley Sams, a program manager at Marine Corps Systems Command, said about the potential dimensions of the new system. Commandant Gen. Robert Neller has recently voiced concern that today’s force has grown too reliant on GPS and other satellite communications systems. As the U.S is increasingly challenged in space, that satellite network is vulnerable to attack, so the Corps is looking for ways to mitigate risks to the force. Future munitions and weapon systems will need to be multifunctioning. “It’s not just a GPS-guided munition, I’ve got to be able to modify it to do different things so I am not going to get spoofed by space,” Neller said in late January at the Center for Strategic and International Studies. The Corps has the funding for the new targeting device, Sams told Marine Corps Times. According the the RFP, the Corps expects to initially field 680 devices. The systems will be issued to fire support teams, which guide air and artillery strikes.